PLANO, Texas--(BUSINESS WIRE)--Jun. 19, 2018-- Cinemark Holdings, Inc. (NYSE: CNK), a leader in the motion picture exhibition industry, announced its plans to build a state-of-the-art, eight-screen theatre at The Village at Totem Lake in Kirkland, Washington. The multiplex will include an XD auditorium with an immersive wall-to-wall screen and enhanced sound system. All eight auditoriums will have reserved seating and feature Cinemark’s Luxury Loungers, which are plush, oversize, electric recliner seats. The theatre will boast a café serving specialty coffee and ice cream options. Cinemark has signed a lease with the development group and has started initial phases of construction. The Village at Totem Lake is an urban lifestyle village in the heart of the Eastside community. 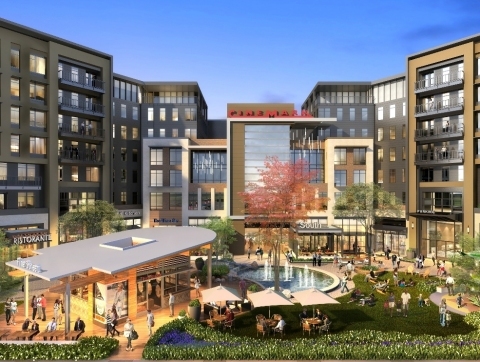 In addition to Cinemark’s state-of-the-art cinema, this growing mixed-use center features premier retailers and restaurants, urban apartments, creative office space, a Village plaza and park featuring a show fountain, and other modern amenities. At the Cinemark Village at Totem Lake theatre, guests will experience cutting-edge technology and customer-preferred amenities, including the features below. Moviegoers from Kirkland to Bothell, Kenmore, Redmond and Woodinville can get the most out of this upcoming theatre by joining Cinemark Movie Club, a unique monthly movie membership program offering ticket and concession discounts, along with other exclusive benefits for just $8.99, plus tax where applicable, per month. The highly anticipated theatre, which is scheduled to be complete in late 2019, will be the development’s premier entertainment destination and complement the neighboring retailers, including Nordstrom Rack, Whole Foods, Cycle Bar, Ulta, Anthony Vince’ Nail Spa, Trader Joe's, ROSS Dress for Less, AT&T, Verizon and T-Mobile, Wells Fargo and Key Bank, and many more to come. Dining options will include several new restaurants near the theater, in addition to MOD Pizza and Chipotle, both of which are already open. For construction progress on the new Cinemark in The Village at Totem Lake development, visit Cinemark.com and stay connected through Cinemark's social media channels at Facebook, Twitter and Instagram (@Cinemark or #Cinemark). You can also follow updates from The Village at Totem Lake by visiting The Village at Totem Lake and on Facebook or Instagram (@shoptotemlake). CenterCal Properties, LLC is a full service commercial real estate company in the business of investing, developing, leasing, and managing destination properties throughout the Northwest, Utah, and California. For more information visit www.centercal.com.